If you are planning a St. Patrick’s Day party or going to your local St. Patrick’s Day parade, it is important to make sure that you wear your Irish that day. Even if you are not Irish by blood, on St. Patrick’s Day we are all a little bit Irish and we can show off our support of all things Irish by wearing green. Of course, you can wear a green t-shirt and call it a day. But, it is a lot more fun to dress up as a leprechaun, the symbol of fun and frolic that we have on St. Patty’s Day. So this page is full of leprechaun costume suggestions for everyone in your family, including the family dog. Everyone can get into the game. For a full costume, these are adorable. The toddler one comes in infant and toddler sizes. Just click through for the variety. HalloweenCostumes.com has more choices for children. You can compare prices on the ones that are the same. They also have more accessories for just a hat or t-shirt for kids. 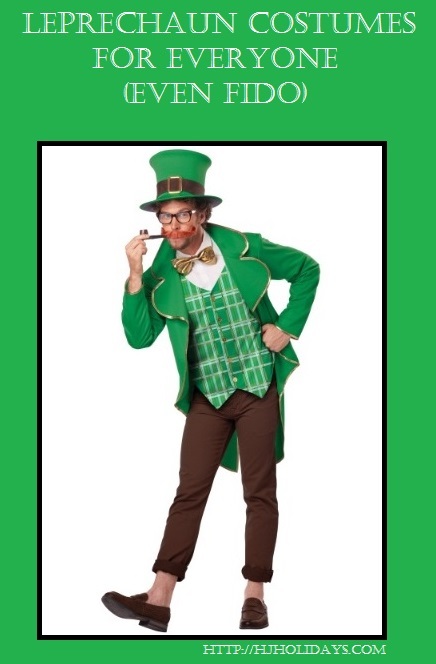 The last costume is the Mayor of Munchkinland in Wizard of Oz but can be used for a leprechaun costume too. Teen costumes are a little tricky. There are not a lot of varieties and two of them are exclusive to HalloweenCostumes.com. Depending on the size of your teen, you can alter an adult costume or they may fit in adult sizes. These teen costumes below are adorable. Dogs can go to the parade dressed as a full leprechaun or they can wear a green bandana. But I have to put this costume here, it is so funny. You can get it in a few places. Here are three to compare price. The first choice is only available through Amazon. There are more selections to choose from for adults. The men have the most authentic looking leprechaun costumes. Each site also has some t-shirts, beards and hats only for you to wear to the parade if you don’t want a full costume. These are the widest range of costume options for men. Some of them are on sale which you can see when you click through for measurements and details. Okay, women. You get the best selection of costume choices for a day in green. These are awesome costumes. You can also buy just a hat, glasses, pants or t-shirt and there are a few options for those. But check out these fun costumes. Again, some are on sale, so check prices and sizes because some only have specific sizes. HalloweenCostumes.com has good information about measurements for each costume, so that you can get the right size the first time. Check each description for measurements and compare, because they are different from costume to costume. Costumes4Less has some alternate versions of the leprechaun costumes, including the General Mills Lucky Charms leprechaun and a mascot. Several are on sale for a great deal on these costumes. Depending on what size screen you are on, some of these pictures may be a bit small, but you can easily click through to see a larger picture and get a full description of each costume. Look too for accessories like glittering green shoes, alternate hats and gloves to finish off your St. Patrick’s Day look.